Create your your own herb garden 6 different herbs to grow indoors or out. 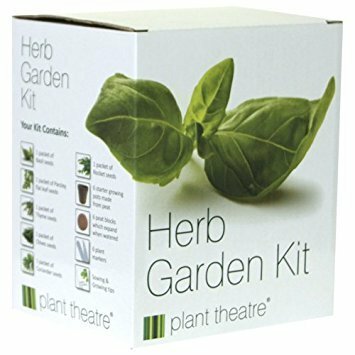 EVERYTHING YOU NEED TO START GROWING your herb garden in one box, we've left nothing out! Ideal for beginners, gardeners and children alike. INCLUDES 6 Peat Growing Biodegradable Pots, 6 Peat Discs that expand to 7 times their size when watered, 6 Plant Markers and of course 6 foil sealed seed sachets, plus full SOWING & GROWING TIPS. FANTASTIC MIX OF FAVORITE FLAVOURS: THYME an old favorite in stuffings and stews, CHIVES excellent in salads, GREEN ITALIAN PARSLEY a nutritious garnish high in vitamins A,D and C, CILANTRO adds flavour to oriental dishes, curries, TARRAGON has a great distinctive flavour, SWEET BASIL essential for authentic Italian cooking. GROW INDOORS OR OUT - Ideal for growing on a window sill if you are short on space, or a patio, porch, veranda or garden. Get growing today and harvest your leaves as required! Home grown TASTES EVEN BETTER. A THOUGHTFUL GIFT beautifully presented in the illustrated gift box with everything you need to start growing, go on treat yourself or a LOVED ONE today!